Course Map lists the Syllabus, Modules, Assignments, Tests and surveys, and gradable discussions. If any of these areas of the course are not used by the instructor, they will not be listed in Course Map. Only discussions and assessments that are published by the instructor will be available in the students’ Course Map. Items that are published but not yet open, they will be listed, but they will not be hot links. Items are listed by open date or in the order that they should be completed, as sequenced by the instructor. Course Map offers many benefits to students. You can get to tasks (readings, tests, discussions, etc.) directly from Course Map. Just click on the title of an item (if available, it will be a hot link). – Completed items are listed with a green check. An item is completed if students submitted or if you awarded a score. – In-progress work is flagged with an ‘in-progress’ icon. Clicking on the item will tell you what you still need to complete. – Work that is not-yet mastered is flagged with an alert icon. This reflects items that require you to achieve a certain passing score. If students are finished and have met mastery, but the assignment is not yet graded, they are informed in the info button or on mouse-over. – Did not complete. If the student didn’t complete the assessment and does not have any further chances to take again. – Did not Complete. May try again. If the student missed the assessment but has opportunities to submit again. – The information icon in front of each item provides details on availability and other requirements (i.e. number of posts required, mastery level) for each item. – If the item is closed, the information icon reflects its status with a red circle. Clicking on it will give you the date that it closed. – If an item has a prerequisite attached to it, the information icon has a lock on it. Clicking on the icon provides information on the prerequisite requirements that you must complete prior to continuing to the next item in the course. When you complete the prerequisite, you will gain access to the next item. Stay on target with items and deadlines. See all open, due and completion dates – all in one page. Verify that your work was submitted. The submission date is recorded and listed in your view. The “Count” column informs you on the number of submissions, discussion posts, and readings you have completed. Access your scores and instructor’s grading feedback from Course Map. – Once items are graded and released, the score will be a hot link. Click on it to access submissions and the instructor’s feedback. 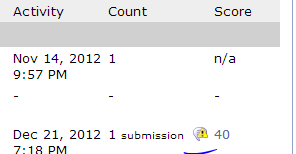 – If your instructor has not yet evaluated your work, you will see “ungraded” in the score column. – ‘n/a’ is used for items that don’t receive grades (i.e. the Syllabus, Modules, and surveys). The Syllabus if considered completed if you read and ‘accepted’ it. At the bottom of the Syllabus, you must accept the agreement. Assignments, tests, or surveys are complete if you ‘finish’ them. You can see the finished date for assessments that are completed. A submitted assessment may not yet be complete if it has a mastery level that you must meet, but you haven’t achieved it yet. Completed discussions are those in which you have posted the minimum posts required by the instructor. For a module to be considered complete, you must view all its content sections. On the module’s home page, you can see when you viewed each section. The dates will be listed. Items that you have not yet viewed will have a dash. Below is a list of the default icons used per item. This can help you identify each item on the Course Map. Published – Viewable in the students’ list. Published (posted) discussions, but not yet visible to students. They have future “make visible on” dates. Deny Access – Invisible discussion or deny access forum. Invalid – Bad dates (invalid items are not visible to students. Once you fix the dates, they will be). Flagged – Flagged items are either newly added in Course Map or their open date was changed in the tools.